Just in time for the hot weather Guess have released their spring/summer 2018 collection and it sure doesn’t disappoint! With watches in every colour under the sun, there’s sure to be a fair few worthy of adding to your collection. Take the awe inspiring Wonderlust W1059L1 ladies watch, the multi-coloured crystal dial exudes happiness and is beautifully contrasted by the crisp white rubber strap. Lightweight yet robust this brilliant watch is the perfect summer accessory. If bright dials aren’t quite your thing, try a watch which whispers elegance, subtly striking, the Chiffon watch is available in both stainless steel and gold plated. The simplistic aesthetic of these watches are truly what makes them so beautiful. Right on trend with their mesh straps and crystal set bezels, these watches will look amazing paired with a flowing dress and flower crown. Don’t worry guys, we haven’t forgotten about you! Guess as a fashion brand are well known for their chic yet casual designs, perfect for everyday and yet so easy to wear for a more sophisticated event. A great example of this is their 2018 men’s two-tone Odyssey W1107G3 watch, with a suave stainless steel bracelet and opulent rose gold centre links this watch is striking from every angle. The alluring deep blue dial really adds to the enigmatic design of this piece whereas the day/date and 24 hour clock cement this as a watch worth investing in. Guess don’t believe that you should have to choose between style or substance and this is clear to see in their new range of timepieces. Combining sporty aesthetics into a classic watch can seem like a difficult task and yet seems so effortless in the Legacy collection, W1049G2 truly encapsulates both of these design styles whilst remaining fresh and current. The rose gold case echoes the designs seen on runways around the world whereas the deep blue rubber strap brings an effortless sense of ease to this watch. 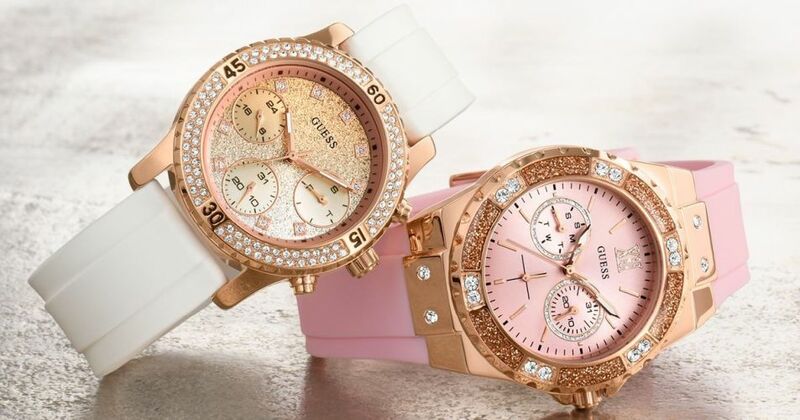 These are just a handful of watches available from Guess, for more information check out the complete range on our website or better yet, pop in store and try them on.